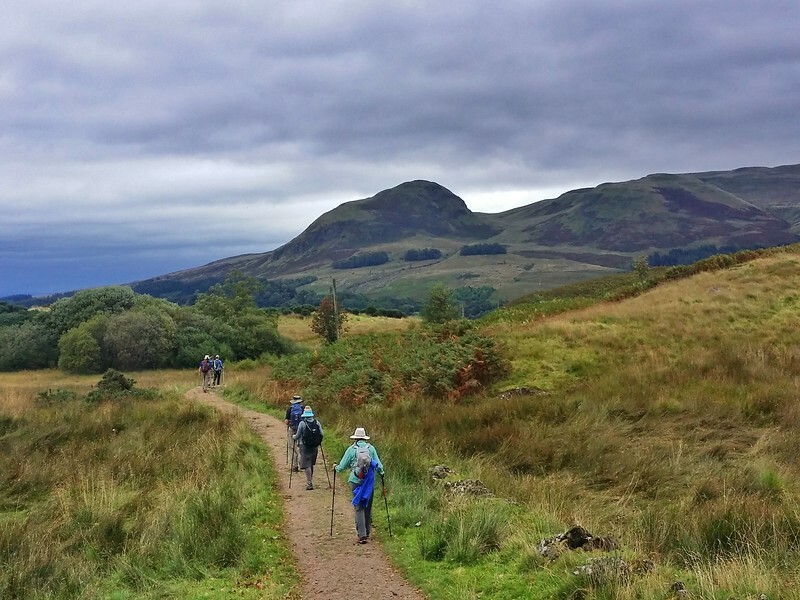 The West Highland Way is Scotland’s first official long distance walking route. It’s also the most famous, attracting 15,000 hikers each year! And for good reason. It’s one of the most scenic long-distance hikes that I’ve done! 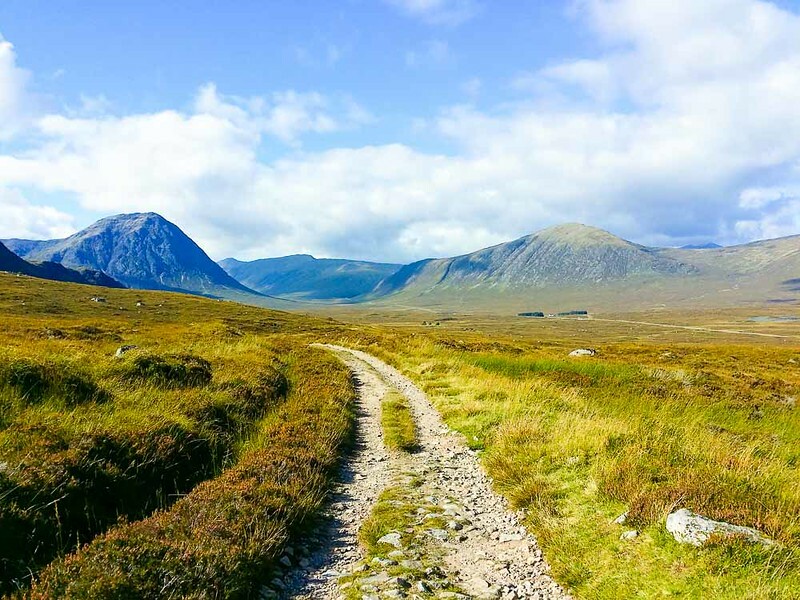 1) Plan your West Highland Way Adventure on your Own. 3) Do the West Highland Way with a Guide. The West Highland Way is a 150 km (95 miles) route completed in 1980. It starts just outside of Glasgow, the largest city in Scotland. And it finishes at the foot of Ben Nevis, the highest mountain in Scotland. It’s near Fort William, known as the adventure capital of Scotland. Hiking along a remote part of the route between Loch Tulla and the A82. If you’re a regular reader you know that I absolutely love long distance hikes and try to do at least one every year. I had walked the Wicklow Way in Ireland just a few months earlier. But when I found out that I was heading to Scotland for the Social Travel Summit, a travel conference in Inverness, I knew that I had to hike in Scotland again. I’d done so ten years earlier, even summiting Ben Nevis, the highest peak in Scotland. But there’s just something mystical about Scotland that never leaves you. It keeps calling you back. Either that or I’ve read too many of the Outlander books. But I knew I had to do it. Being the most famous, and arguably one of the most scenic treks in the UK, the West Highland Way was an easy choice. It’s not just me who feels that way. I recruited my friend and fellow hiker Simon from Wild About Travel. It only took one Facebook message. Click on the link to read her article. 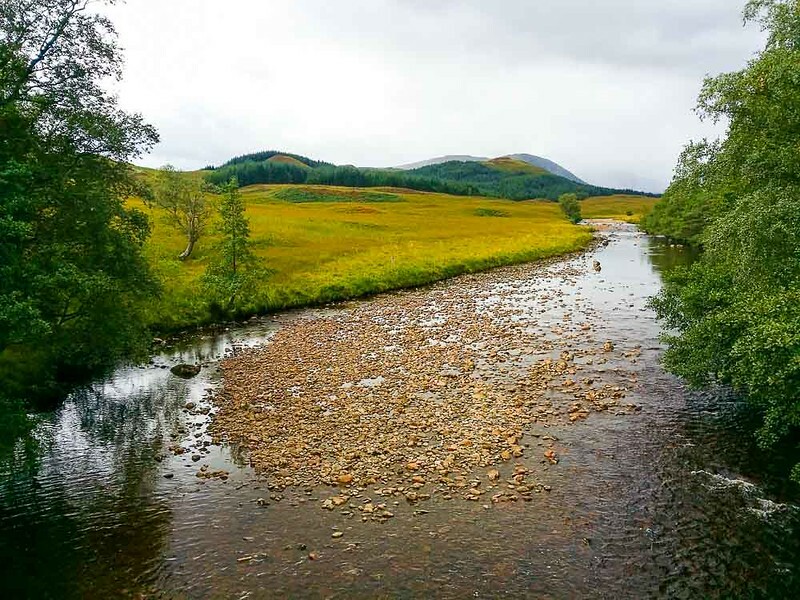 With its dramatic landscapes, the West Highland Way is practically begging you to hike it. The landscape is ever-changing and almost always breathtaking. 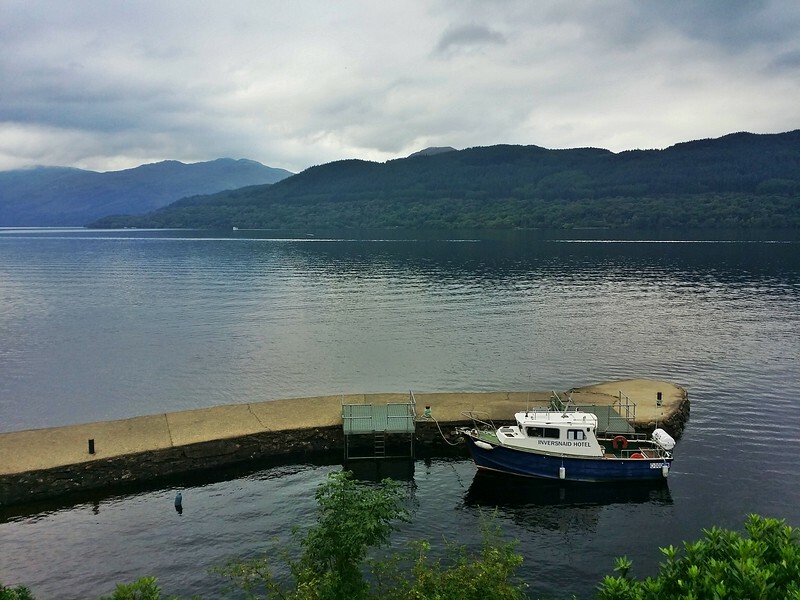 You’ll walk the length of Loch Lomond, the largest freshwater lock by surface area in all of Great Britain. You’ll pass through the Lowlands, cross the Highland Boundary Fault and head into the Scottish Highlands. For much of the way, you’ll be following ancient and historic routes along Drove Roads, 18th Century Military Roads and abandoned railway tracks. The typical way to hike the West Highland Way is from Milngavie in the south to Fort William in the north. The easier stages in the south will prepare you for the hillier parts that come in the northern part of the trek. Furthermore, the scenery just gets more and more exciting in my opinion, so it makes sense to end in the mystical Scottish Highlands. Milngavie is a town ~ 10 km (6 miles) northwest of Glasgow. You can spend the first night either in Glasgow, as I did. From there it’s ~ 30-minute train ride to Milngavie. Alternatively, you can head directly to Milngavie. The closest airport is Glasgow Airport. I booked my flight with Skyscanner. 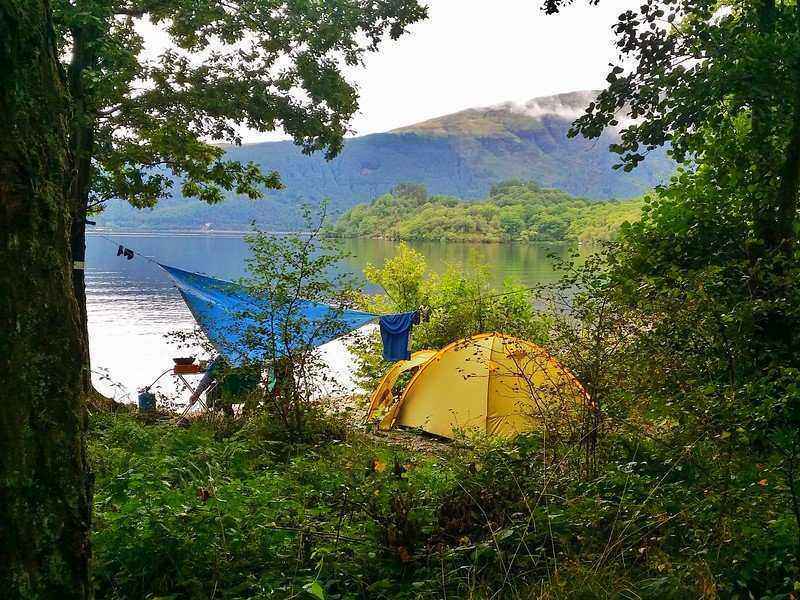 You can camp along the shores of Loch Lomond. This is the cheapest option. It’s ideal if you’re camping and on a tight budget. If you go this route, this guide with walking maps will be essential to figuring it out. It’s by far the most time-consuming and least convenient option. Finding and booking accommodation takes a ton of time. If accommodations on the trail or close to the trail are all full you’ll have to figure out how to take a taxi and add that into your costs. It’s doable but a hassle and very time-consuming. You also won’t have the possibility to have your luggage transferred for you. My friend and I choose the self-guided option with Wilderness Scotland. They’ve been named by National Geographic Adventure as one of the Best Adventure Travel Companies so you know that you’re in good hands. There is very minimal planning and time to organize on your part. Wilderness Scotland does everything for you. They’ll arrange luggage transfer for you daily. You just need to carry your daypack. They also know the best B&Bs and hotels to stay in and book these for you. On one day there wasn’t any accommodation available close to the trail. They organized taxi pick up and drop offs which was super easy but would have been difficult to organize on my own. Finally, they provide support during your trek if something goes wrong. While it’s slightly more expensive than doing it yourself, I honestly don’t see any cons. I think the slight extra expense outweighs the time and inconvenience of having to do it all yourself. The only other con is using the maps and following the detailed instructions that they provide to find your way. I personally enjoy this but if you don’t, you should consider option 3 below. In addition to the same advantages as listed above with the self-guided walk, your guide will bring to life the rich history and legends. I missed out on this by doing a self-guided walk which is a shame since Scotland is full of fascinating history. And be honest…if you’ve ever watched the tv show Outlander, or read the books, you want to know as much as possible about the Highlanders. Your guide will also point out the diverse flora and fauna that you’d likely miss on your own. Furthermore, you’ll be hiking in the company of like-minded hikers. There’s nothing like a shared interest over multiple days to connect with someone. I met my boyfriend while on a hiking day tour so am living proof of this. Although I’m pretty sure the tour doesn’t come with a guarantee of finding a partner :). Most of the meals are included with the guided tour ensuring that you always have someone to revel in the day’s adventures with. I’ve hiked the Wicklow Way in Ireland and did the Coastal Hike from Spain to France alone. While I didn’t mind walking alone, I didn’t enjoy eating dinner alone. I wanted to share what I’d seen and done that day. It’s also a great option if you’re not comfortable with route finding and just want to focus on enjoying hiking and not reading a map. While the guided trip is reasonably priced at £1375, it is more expensive than if you did it by yourself or chose the self-guided walk. Still, I think it provides exceptional value and benefits. After one expensive incident years ago where I didn’t have travel insurance, I always get it. It’s especially important when doing something adventurous. Like hiking the West Highland Way where a slip can lead to a broken ankle. Often the nearest hospital is miles away, so even a taxi ride is costly. Let alone the medical treatment. I’m a fan of World Nomads Insurance. You should also travel with an Outdoor First Aid Kit. And have something for blisters which often plague hikers and can ruin your trip. I always have Compeed in my backpack. It’s the best solution for blisters that I’ve found. You’ll see pristine crystal clear rivers while hiking. If you’re carrying all your luggage, you’ll want to travel as light as possible. If you’re having your bags carried for you, you don’t have to be as strict. But you ‘ll still want to keep the weight of your day pack to a minimum. It’s worth noting that you should carry electronic equipment like laptops, cameras, etc. with you at all times. Don’t place them in your carried luggage. The luggage carrier company is not responsible if they go missing or are damaged. As Scotland can be rainy, put any electronics in a Waterproof Dry Bag to make sure they stay dry. 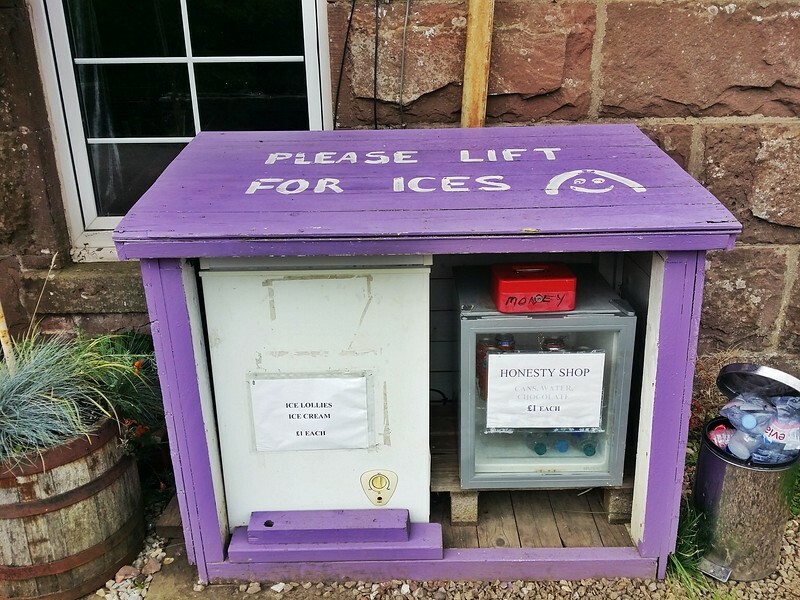 You’ll see “honesty boxes” along the West Highland Way which capture Scottish hospitality. Every B&B that I stayed in provided a hearty Scottish breakfast. If you haven’t had a Scottish breakfast, they’re very filling! There was also a place to eat dinner each night in the places I stayed in. However, on most days you won’t find restaurants while you’re hiking. Or they will be several kilometres out-of-the-way. So either bring food with you, or ask your B&B to prepare a packed lunch for you (at an additional cost). There are a few days when you will not come across anywhere to buy food during the day or in the evening. I stocked up at a grocery store in the evenings when available. On average, I had 3 days of food (lunch and snacks) with me. I took when I needed for the day. Then packed the rest in my luggage that was being transferred to keep my backpack weight to a minimum. One of the advantages of booking with Wilderness Scotland is that they give you a PDF of all the amenities along the way. That way you can prepare appropriately. It’s ~ a 30-minute train ride from Glasgow to Milngavie so you can sleep in Glasgow and take an early morning train to Milngavie. Alternatively, you can head straight to Milngavie where the walk begins. Also worth noting is Milngavie is pronounced Mul-guy. 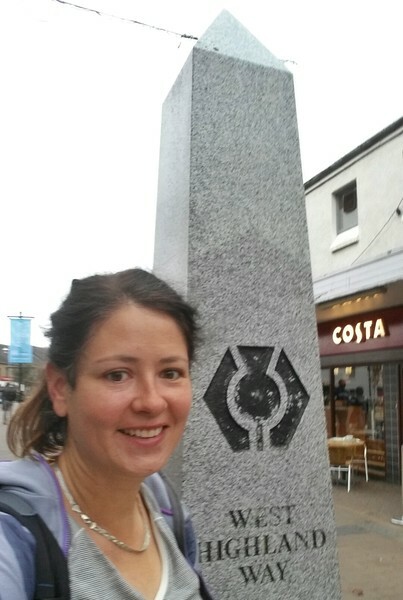 Me at the start of the West Highland Way in Milngavie. 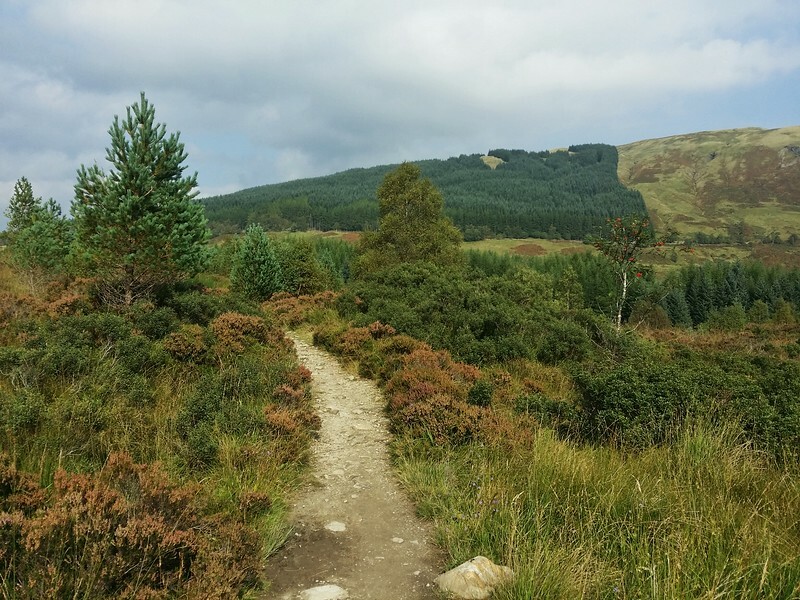 Description: Your hike begins in the town of Drymen. There are plenty of cafes to give you a caffeine fix. It then continues through wooded areas and pastures passing Craigallian and Carbeth Lochs. Then you’ll reach the village of Drymen. It was a popular stop in the 18th and 19th centuries for Highland cattle drovers. It was a popular stop in the 18th and 19th centuries for Highland cattle drovers. Highlights: Meeting a couple of other hikers who I often ended up walking with. And throughout the walk and getting a taste of the scenery that was to come. Simon from Wild About Travel, walking along Loch Lomond. Description: Following the eastern bank of Loch Lomond. It’s one of the most gorgeous lochs in the entire country, until you reach the rural area of Rowardennan. Here you get fantastic views of Loch Lomond. 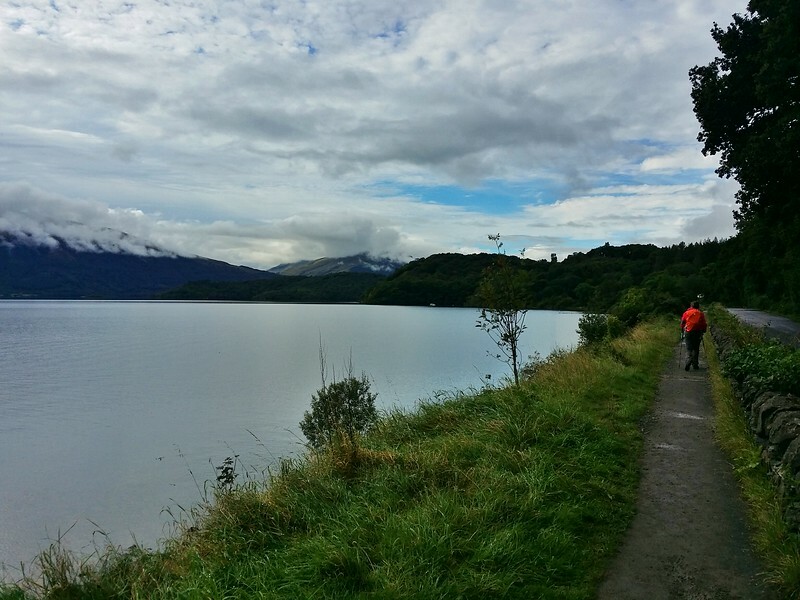 Highlights: Spending hours walking along Loch Lomond. 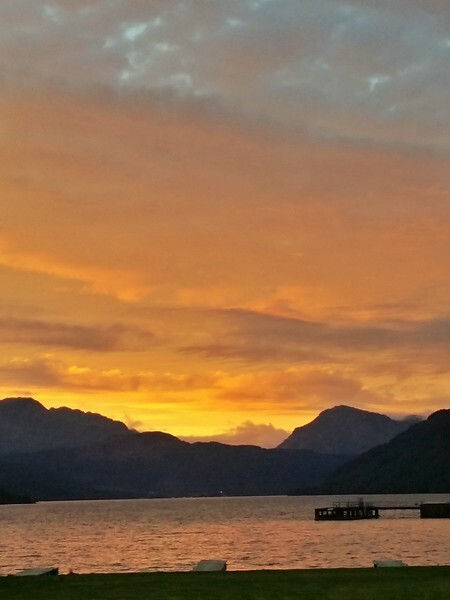 And the incredible sunset over Loch Lomond from Rowardennan. It felt as if the sunset was my special reward for hiking the West Highland Way. Description: This is one of the remotest parts of the West Highland Way. 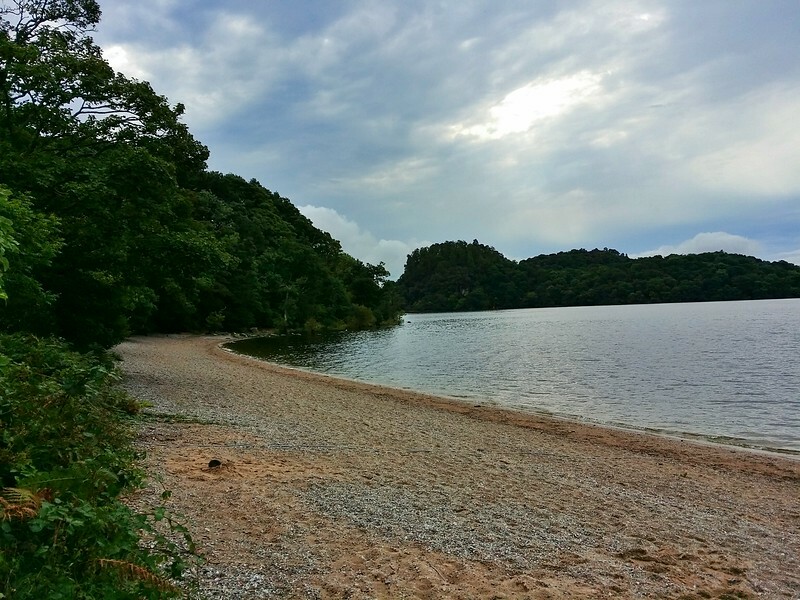 You hike along the north-eastern shores of Loch Lomond. The trail is slippery, and slow going with rocks and branches peeking out on the trail. But it improves as you reach Inverarnan. Some walkers consider this the most difficult part of the trail because of the terrain. As long as you’re prepared to go slower though, it won’t give you any problems, and I loved it. There’s also an easier detour. Highlights: This was one of my favourite days of the entire walk. There’s something incredibly peaceful about walking along the water. And because I had to slow down because of the terrain, I appreciated it more. The landscape changes dramatically as you enter the Highlands. Description: Congratulations! You’ve now reached the Highlands. Here the mountains are much bigger. You’ll get an especially stunning vista in Strath Fillan. At the end of the day, you’re more than half way finished hiking the West Highland Way. Highlights: I was excited to finally reach the Highlands. I loved seeing how dramatically the landscape changed after walking along the serene shores of Loch Lomond. In all honesty, this day landscape-wise, was one of my least favourites. It was scenic but lacked the wow-factor that many other days had. 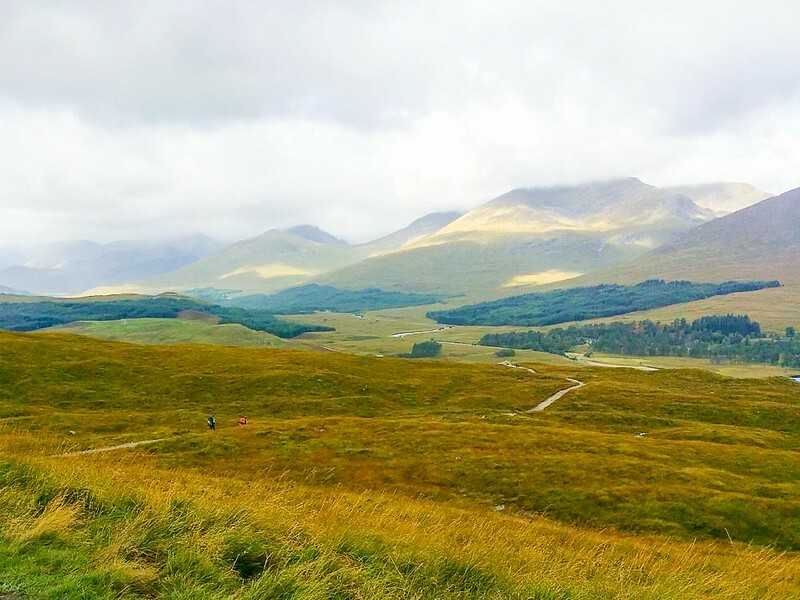 Your reward for climbing Ben Inverveigh is a stunning view over Loch Tulla. 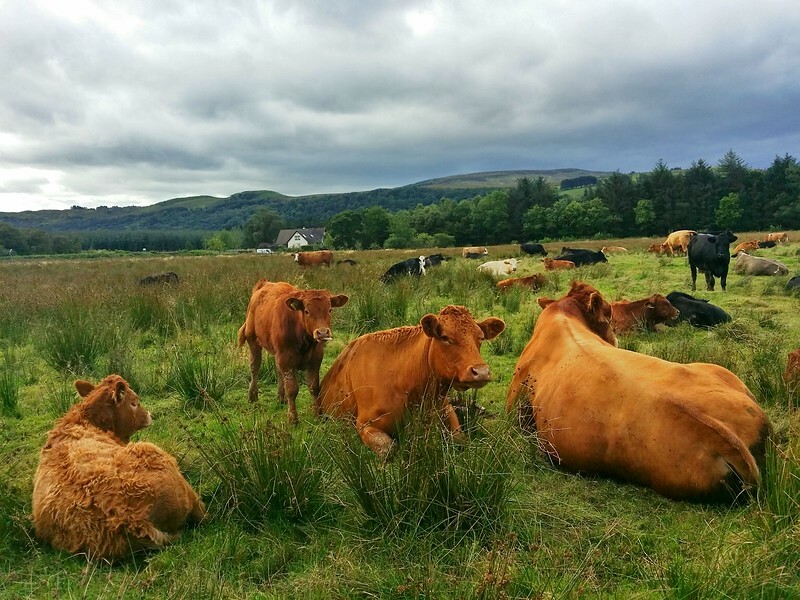 Description: While this is by far the longest day of hiking on the West Highland Way, you’re walking in some of the finest scenery in the Highlands. You’ll climb up past Loch Tulla, then across the remote and wild area of Rannoch Moor to Glencoe. After your long day of hiking there’s a cold one waiting for you at the King’s House. Note: It’s closed for reservations for 18 months, but their brand new Bunk House will be open. You’ll likely need a taxi to pick you up from here and bring you to your accommodation. It’s one of the reasons I appreciated hiking with Wilderness Scotland. They arranged everything for me. And after hiking 30 km, the last thing I wanted to do was figure out how to get a taxi. Highlights: I met two other Canadians while hiking this section – Go Canada! The scenery was spectacular and during the second half remote. I absolutely loved it. I stayed in a B&B in nearby Glencoe. With its high mountain peaks, rivers and waterfalls, it has a mystical feeling that will pull at the heartstrings of any adventurer. I plan to go back. View of Loch Achtriochtan seen while descending Devils Staircase to Kinlochleven. Description: While the first climb up over the Devil’s Staircase, a high mountain pass, will get you huffing and puffing, it’s not nearly as difficult as the name indicates. Besides, you’ll forget all about it once you take in the stunning vista from the top. You’ll descend to the small village of Kinlochleven, famous for its Ice Factor Sports Centre, where ice climbers come to practice in artificial, yet realistic conditions. You’ll descend to the small village of Kinlochleven, famous for its Ice Factor Sports Centre. Ice climbers come here to practice in artificial, yet realistic conditions. Highlights: The landscape was absolutely stunning, especially from the top of Devil’s Staircase and for the entire descent. This was one of my favourite days, and not just because it was short ;). Description: The trail climbs over a mountain pass, but then rewards you with spectacular views of Glencoe. You’ll continue on, before walking along the foot of Ben Nevis, the highest mountain in Scotland. The last few kilometres walking along the road feel like a slog, but knowing that you’re THISCLOSE to finishing keeps you going. Ben Nevis is peeking out from behind the clouds. Highlights: The views of Glencoe after the first climb, the way the sun hit an old farmhouse while I was walking through a valley. And how Ben Nevis peeked out from behind the clouds for about 20 seconds, revealing just how massive it is. And most importantly, completing the West Highland Way! Revel in your success, then climb Ben Nevis, the highest mountain in Scotland if you still have the energy to spare or head to your next adventure! I’ve been to Scotland before, climbed Ben Nevis, the highest mountain in Scotland, and had high expectations for the West Highland Way. Despite that, it far exceeded them. 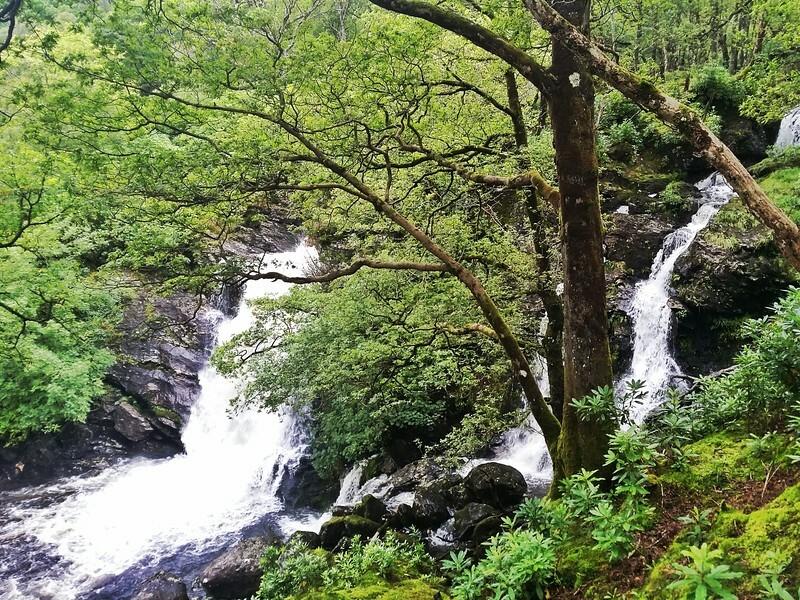 It’s one of the most beautiful long-distance hikes I’ve ever done with its dramatic changes in the landscape, from walking along the shores of Loch Lomond to hiking over mountain passes in the Highlands. Scottish hospitality is also out of this world. I felt so welcome at each B&B that Wilderness Scotland had booked for me. I’d highly recommend walking the West Highland Way to anyone even remotely considering it. And I highly recommend doing it with Wilderness Scotland. Either with their self-guided tour, that I did, or their guided tour. Disclosure: Thanks to Wilderness Scotland for making my self-guided tour possible. As always, all opinions are my own. This post has some affiliate links in which I make a commission if you purchase something, at no extra cost to you. Brilliant post, Lourdes! Lovely post, and god, how much do you walk? Truly amazing! I wish I could too take these trips just like you! Someday soon, but till then I shall continue to live my dream through your lovely blog. I am just curious, how much do you end up spending on a daily basis on these trips? Time and money are 2 of the most important factors stopping most of us from traveling. Maybe your input can help us better understand and perhaps even give us the courage to travel, and I mean not just to work/office each day! Decent days with good weather were offset by rainstorms and very poor trail maintenance. Although my waterproof boots proved mostly up to the task, the vibram soles had serious grip problems on the loose and wet trail surfaces. Hiking poles saved me from more than one mishap. The trail proved so rough that I altered my socks in order to fit an additional insole in my boots; to better protect my feet from the continuous beating of the unusually-rough trails. Which,by the way, were often nothing more than gullies caused by runoff. In moderate to heavy rain expect to be walking through three to four inches of water. Sometimes all day. Waterproof boots and waterproof gaiters are a must. One of my companion had a softer sole boot, which proved a better grip on the trail surface, although he also complained about sore feet due to the roughness of the never-maintained trail system. My suggestion is to go somewhere else if you want to hike in the UK. @James - Thanks for sharing your experience. Sorry to hear that you got hit by rainstorms and that you didn't enjoy the experience. so beautiful palce and full with natural things. Waterfall is looking so beautiful and so stunning photos you shared of that place. The scenery is just stunning. I also love to walk but have never done a long-distance hike of more than 2 days. My family and I are planning a trip to Scotland for next June, and we can't wait! @Jenna It truly surpassed my expectations! Even if you don't do the whole way, the way along Loch Lomond is lovely and lots of great places to go for a swim. Brilliant post, Laurel! Lovely post, and god, how much do you walk? Truly amazing! I wish I could too take these trips just like you! Someday soon, but till then I shall continue to live my dream through your lovely blog. I am just curious, how much do you end up spending on a daily basis on these trips? Thank you so much for sharing it. Thank you! I hike every weekend and try to do at least 2 long-distance hikes or cycle trips a year. For B&B accommodation, dinner and snacks on the trail it works out to be ~€60-80 per day, based on double accommodation. You could do it cheaper if you camped, but after a long day of hiking, I like a hot shower and a comfortable bed. Hi Laurel. 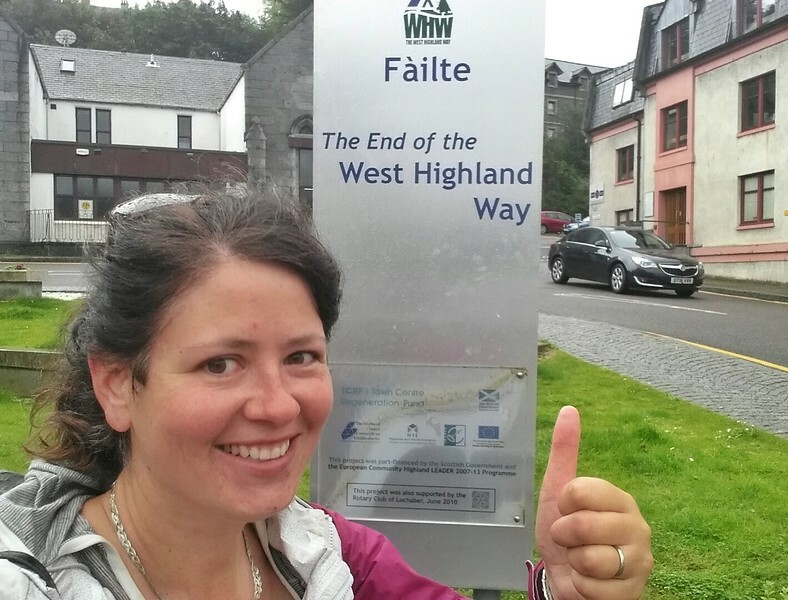 I completed the West Highland Way in seven days, four years ago. Carried all my luggage but would possibly use one of the transport options next time & just carry a daysack. However I wanted to say that we walked the reverse route, the 'wrong way', from Fort William to Milngavie & it was just as exhilarating! The views were fantastic and I met people walking north who had completed what was in front of me, so got info on the underfoot conditions as well as good bars/restaurants etc. The bonus was walking DOWN the Devil's Staircase. Thanks for your guide and get in touch when back in Scotland. @Gerry Thanks for sharing your experience of walking it in reverse. Sounds fabulous! So glad that you enjoyed it. Did you trek solo? If not, is it safe for a woman alone? Thx. Yes, I trekked solo and felt very safe.